This report provides you with information about your group’s culture, something that isn’t always obvious from looking at a pile of individual reports. Facilitators often like to know what to expect from a group and this report gives them a forecast. Perhaps the overwhelming numbers of participants with the i style will mean the facilitator will bring a loud buzzer instead of a soft chime to sound when it’s time to end small group discussions. The facilitator might want to pay attention to a lone S to be sure that this one person doesn’t have to do all the speaking for that style. Or the facilitator might assign seating for a training session and make sure that all four styles are represented at each table. If you’re going to conduct the Day in the Life activity, it can be helpful to know in advance if there’s a missing style or a style with a very small group to represent it. You want to be prepared for that. You might see that you have someone whose dot is right on the line between two styles; you can let them know that they are welcome to participate as whichever style they’re most comfortable with today. Some facilitators like to host a DiSC Group Culture session a few weeks after their initial DiSC training. They use the Facilitator Report to prepare for that follow-up session. This graph has an an accompanying poster available in EPIC. This can add a nice visual element to your training room. This report is similar to the Facilitator Report, but it contains no names. This report is often shared by facilitators with their groups. Teams that work together might also share their group maps and a few pointers for working with their particular group. Facilitators can use this report to generate discussions about a team’s group culture. You’ll see a set of questions under the “Issues to Consider” heading for each style of culture. The group can discuss questions like “Do we let status get in the way of good decision making?” or “Do people in the S region feel like they get feedback that is too cold and insensitive?” These same questions appear in the Everything DiSC Facilitator Report. This graph also has an accompanying poster available in EPIC. 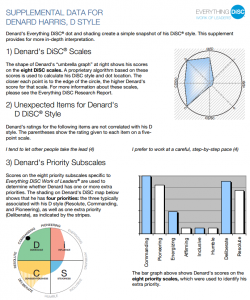 This simple report shows the style and dot placement for each participant in your Everything DiSC assessment group. It makes it easy to see how everyone scored and displays their names. There is no upper limit to the number of respondents that can be included in the report as long as you have at least three. This is a handy reference report for the facilitator. Some coaches will use it when talking with managers about their teams as long as each member is comfortable with their styles being shared. We’ve seen this turned into a poster so participants don’t forget other member styles. I’ve written before about the power of Everything DiSC Comparison Reports which can be run for any two people who have completed an Everything DiSC profile. The report is run from EPIC, the online administrative tool. Run this report for managers and their staffs; run it for off-site employees; run it for newly formed teams; run it whenever you have the opportunity. You can even run the reports as a batch. I love this report. 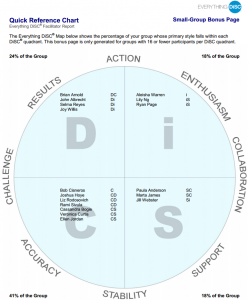 Another free report generated in EPIC is the Everything DiSC Supplement for Facilitators. 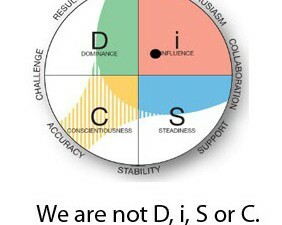 This gives an even richer insight into a person’s DiSC style. It’s probably not necessary for each person you give the DiSC assessment to, but it can be very helpful for those who don’t feel it quite matches their vision of themselves. It’s also helpful for people with an extra priority (have a shaded area on their circle). If you’re going to meet one-on-one with someone, this can be a nice short additional report to go through before meeting with them. You might also choose to share it. 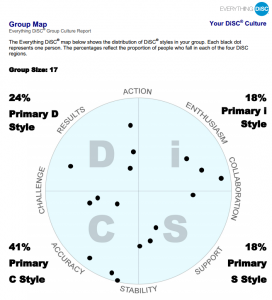 With MyEverythingDiSC, learners now can connect with coworkers and others who have completed an Everything DiSC assessment. Whether they need to prepare for a meeting with a new project team or learn about a new coworker, Comparison Reports can help learners understand each other. And for those who want to dig deeper into research and theory, MyEverythingDiSC.com has the tools and resources—on-demand. We’d love to hear how you use these reports. Please share your thoughts in the comment section below.